We're experiencing yet another heat wave again in Southern California, with temperatures expected to hit, oh, about 105 or 106 degrees here later today. (I'm refusing to order a pumpkin latte from Starbucks until it drops down into the 70s. Still waiting.) 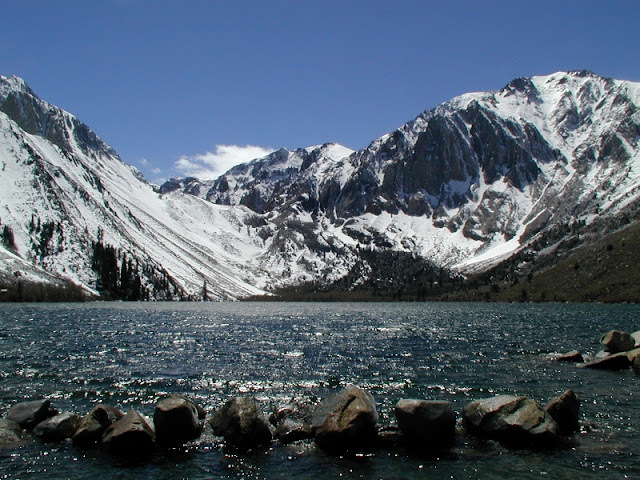 So it's no accident that I chose to kick off my 31-day series with my trip to Convict Lake. 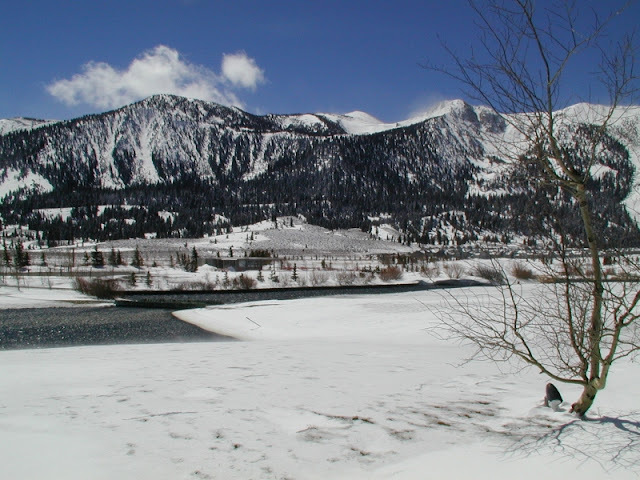 I knew that I'd get to look at lots of pretty pictures featuring snow, freezing water, snow-capped Sierras, and more snow. 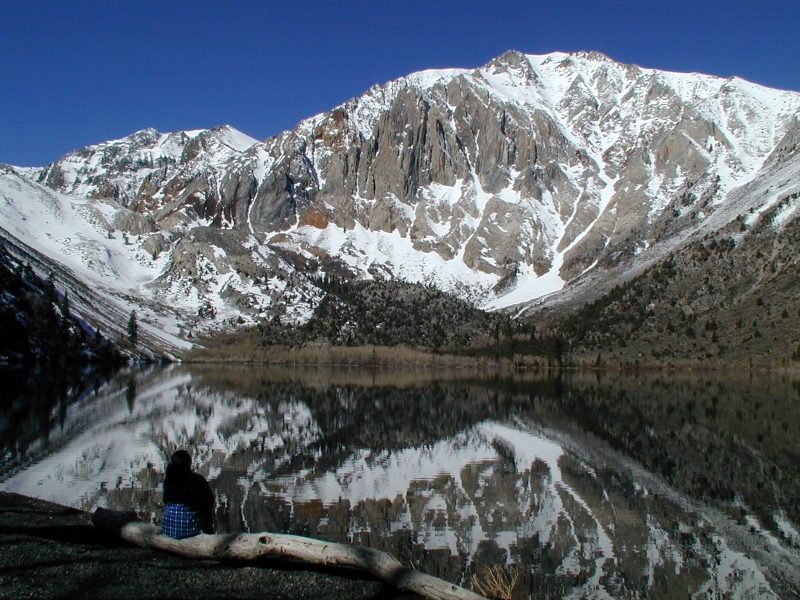 My husband and I visited Convict Lake, located in the Eastern Sierras near the Mammoth ski area, in April of 2000. That's right – the photos here are almost thirteen years old. I was a grad student at the time, looking for a spring break getaway. 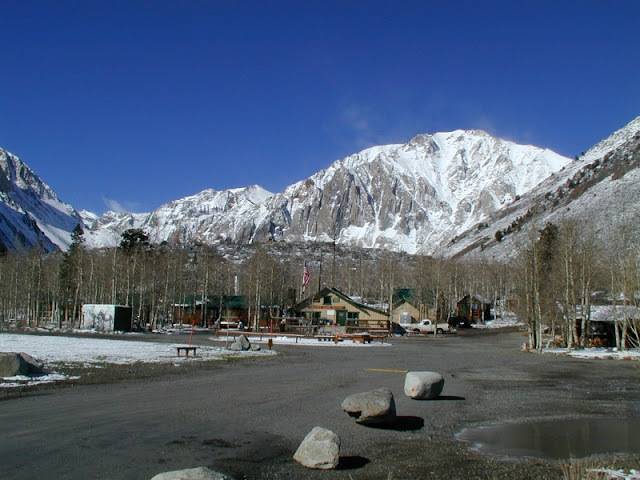 A former co-worker at one of my old temp jobs had mentioned how she and her new husband loved to escape to Convict Lake – she enthused about cabins and hiking and horseback riding, and fishing from the rental canoes. And I'm sure you can do all of those things – in the fall and summer. Back in 2000, I was still a bit of a newbie when it came to vacation planning, and didn't stop to consider that April in the Sierras is still very much snow season. 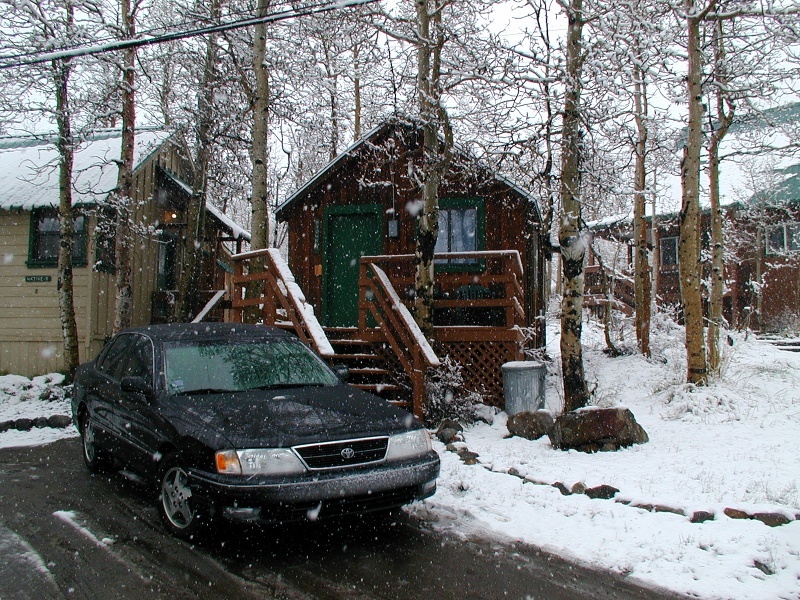 Our cabin was tiny (there are various-sized cabins for rent), and I don't think there was a television in the room, so it was definitely a romantic getaway. That first night, we ate in the small, but very good, restaurant at the resort. I remember icicles hanging in my view out our window, and a fireplace crackling in the corner. The morning after our stormy arrival, it was all blue skies and towering, snowy mountain crags. It was very beautiful, and somehow frightening, too. 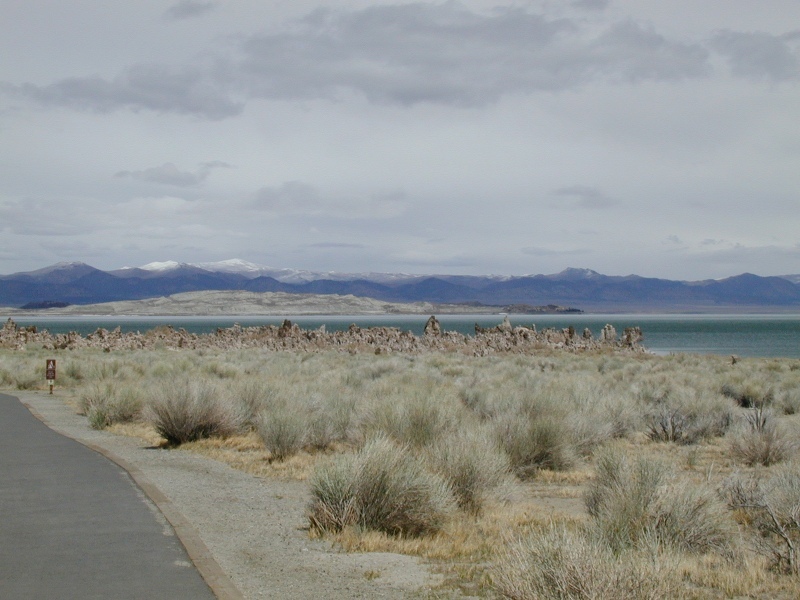 One of our side trips was up the highway a bit, to visit Mono Lake. I've seen gorgeous, mysterious photographs of Mono Lake and its strange tufa formations (read more about that, here), but my own photos show only a windswept, cold lake with a dry and sandy shoreline. 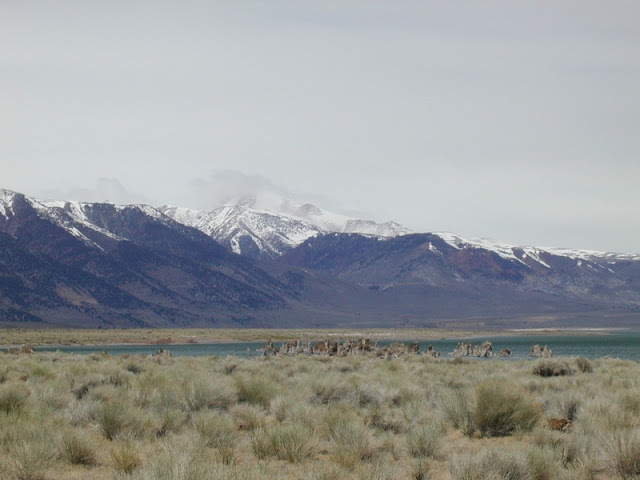 The Sierras mean business. They are Mountains like the Himalayas are Mountains. A perfect, still moment. Me on a log beside the perfect calm of Convict Lake. I look at that photo and wonder that my life was ever that quiet. 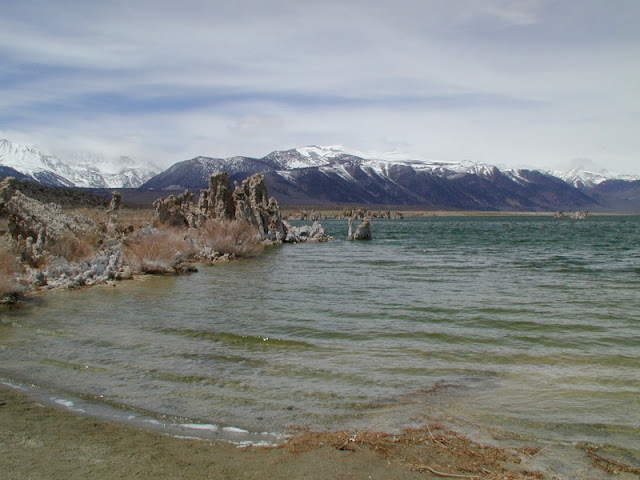 If we were to visit now with our two children, they'd shatter that morning stillness with their chattering and clambering around on the logs and boulders, and I'd be worried that they'd fall into the freezing water and get hypothermia. Life can change a lot in thirteen years down here on the human plain. 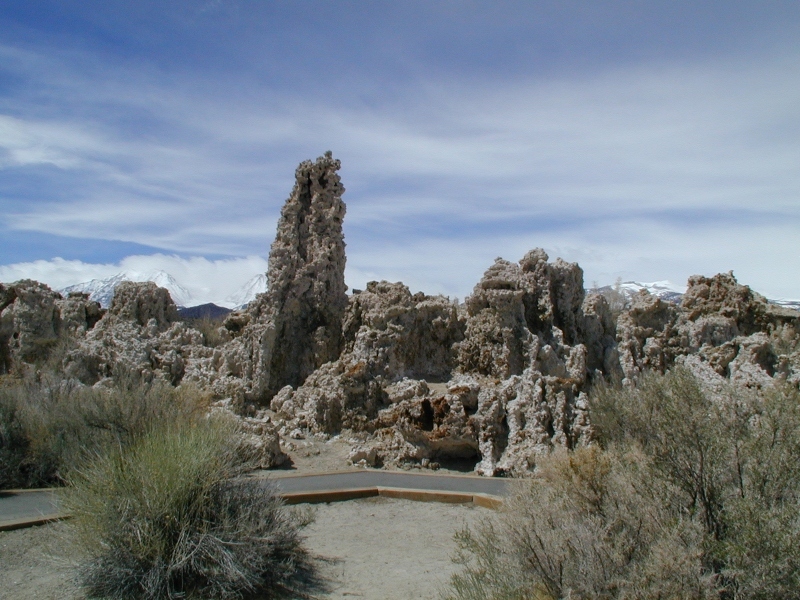 But up in the Sierras, thirteen years is but a blip, a moment up in the high reaches of the mountains. Thanks for coming along! Come back tomorrow for Day 2 of my 31 Trips in California,when my daughter and I visit some beautiful gardens located in the midst of my dream neighborhood. Don't miss a single trip -- Follow along and Like me on Facebook.